Conduent is actively seeking Remote Tech Support Reps in the following states: Alabama, Arizona, Arkansas, Colorado, Connecticut, Delaware, Idaho, Illinois, Indiana, Iowa, Kansas Kentucky, Louisiana, Maine, Maryland, Michigan, Minnesota, Mississippi, Missouri, Montana, Nebraska, Nevada, New Hampshire, New Jersey, New Mexico, North Carolina, North Dakota, Ohio, Oklahoma, Pennsylvania, Rhode Island, South Carolina, South Dakota, Tennessee, Texas, Utah, Vermont, Virginia, West Virginia, Wisconsin, Wyoming. Starting pay is $11-$11.50 per hour plus benefits. Go here to apply. 51 Talk is seeking work from home ESL teachers for immediate hire. The pay is reported to be $18 – $22 per hour. A bachelors degree is required. Apply here. Triple AAAA is hiring Remote Customer Care Reps to work from home. This position is open California residents only. Go here to apply. Starting pay is $18 per hour or more based on experience. More high-paying jobs are listed here. Online Map Quality Analyst ( Canada) – Apply Here! Social Media Internet Assessor ( Canada) – Apply Here! All workers are required to work a minimum of 20 hours per week. More part-time jobs are listed here. TFE is hiring transcriptionists/transcribers worldwide. Schedules are flexible. All candidates must possess strong computer skills, Go here to apply. Want to learn more about Transcription? Take this free online course at TranscribeAnywhere.com. Assistant Match is seeking Virtual Assistants to work from home. The job may involve taking phone calls, scheduling appointments, organizing files, and more. Go here to apply. Graphic Designer/Strategist – Apply now! Content Writer – Apply now! Social Media Manager – Apply now! VIPKid is actively seeking part-time Online Teachers. You can set your own schedule and earn up to $22 per hour. Must have a bachelor's degree in any topic. Go here to apply. This company has openings for Court Researchers in the US. You can make $12 per hour as a courthouse researcher. You must visit your local courthouse frequently to retrieve info. Go here to learn more about the position and apply online. This company currently needs Survey Takers. The minimum cash out for users of this site is $3 which is equivalent to 300 points. Membership is open to people from the United States, Canada, United Kingdom and other European countries. Click here to sign up. Working Solutions hires Work from Home Agents to take & place calls, data entry, chat online, send emails, and more. The pay can range anywhere between $9-$30 per hour depending on the position. Click here to learn more and apply online. Want more work from home job leads? Stay up to date by following our Facebook page. Looking forward to connecting with you. 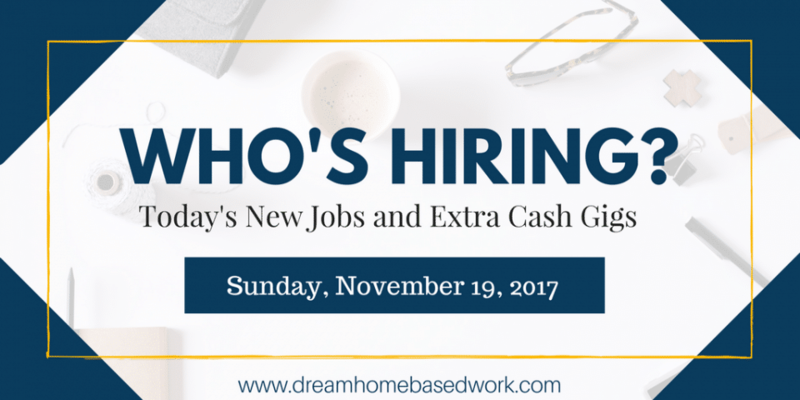 25+ Work at Home Companies That Are Currently Hiring! 20 Work at Home Jobs that Pays $11 Per Hour or More! 50 Work at Jobs That Pays $16 Per Hour or More! 15 Work at Home Jobs That Pays $20 Per Hour or More!